Adults: Take three (3) capsules daily. Take consistently for optimum benefit. Children (under 12): Take one (1) capsule daily. Take consistently for optimum benefit. Since I've been taking the hair, skin, and nails formula I've noticed small bumps on my face. What should I do for this problem? I like the product for my nails and hair but I i never had acne before. Skin problems mean there is something in the blood that doesn't belong there. We would recommend the Blood and Lymphatic Formula or the Full Body Cleanse if you haven't cleansed in the last 6 months. Yes, you can take this supplement while pregnant. I am trying to conceive and would like to know if this product is safe to take during pregnancy? Thank you. 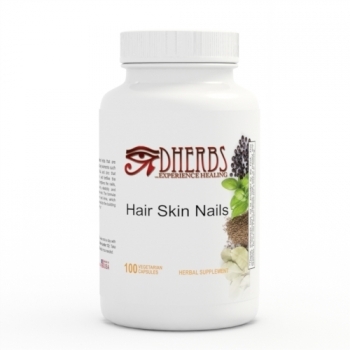 Yes, you can take the Hair Skin and Nails supplement while pregnant. You won't really have a need for it as your hair and nails grow with pregnancy, but it is safe to consume. Is this a good product for males with thinning hair Thanks. Yes, we recommend trying the Hair Skin Nails formula along with the Hair & Scalp Oil as a topical solution. Both formula's are good for both male and female.